I have worked with entrepreneur and author Charlie Cummins for many years. 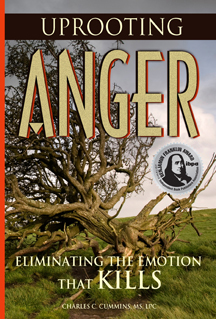 It was exciting to partner with him in designing the cover of his book, Uprooting Anger: Eliminating the Emotion that Kills. And thrilling when his book was named a finalist in the psychology division of the Ben Franklin Award from the Independent Book Publisher’s Association. The front cover received the highest review possible. Charlie’s book is available on Amazon as both a printed book and on Kindle. Watch a video presentation I gave about tips for working with a graphic designer where I used Charlie’s book cover as the example of the design process. Charlie was my guest on the Write Here Write Now radio show and talks about how he leveraged his book for more speaking opportunities. This entry was posted on October 26, 2010 at 8:59 pm and is filed under award, books, business, psychology. You can follow any responses to this entry through the RSS 2.0 feed. You can leave a response, or trackback from your own site.